Survey results for the S.C. Department of Natural Resources (DNR) 2011-12 Bobwhite Quail Hunter Survey indicates an average of 0.46 coveys per hour were flushed during the 2011-12 season, a slight increase from the 2010-11 season. Quail bagged per hour also increased slightly and rabbits jumped per hour increased significantly from last year. The reported average covey size decreased from the previous year. Fifty percent of those responding rated the 2011-12 season as poor, while 29 percent gave the season a fair rating and 21 percent a good rating. Quail harvest rate in the Midlands was higher than in the other three regions (the Piedmont, Northern Coastal Plain and the Southern Coastal Plain or “Low Country”). 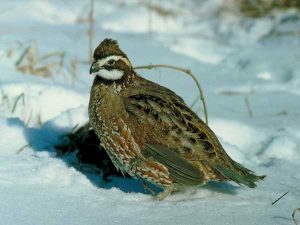 The reported average size of quail coveys ranged from 9.1 birds per covey in the Piedmont to 10.7 birds per covey in the Midlands. Calhoun County claimed the top spot in the coveys per hour index at 1.51, followed by Sumter (1.18) and Horry (0.73) counties. Sumter County led the state in quail harvested per hour at 1.85, followed by Darlington County (0.87). County results should be interpreted cautiously due to the relatively low number of hunts upon which they are based. Plans are underway to continue the Quail Hunter Survey for the 2012-13 season. Efforts are ongoing to increase the number of cooperators and all avid quail hunters are encouraged to participate. Contact the DNR Small Game Project, P.O. Box 167, Columbia, SC 29202, (803)734-3609, to be included in the survey.